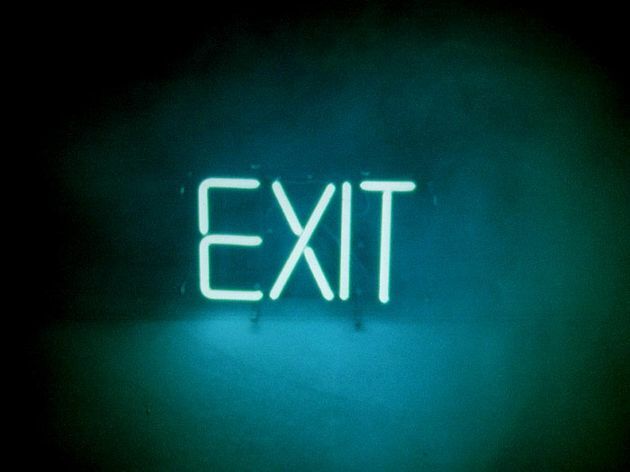 You are at: Home / Agora / What would a clean bailout exit for Greece mean in numbers? What would a clean bailout exit for Greece mean in numbers? The discussion in Greece associated with exiting the troika program early is politically charged, primarily because it has a high degree of correlation with the viability of Prime Minister Antonis Samaras’s government. I will attempt here to add some figures to the discussion and set out what the implications are beyond the political front. After the ESM and the IMF, the ECB is Greece’s third largest creditor. As part of the SMP program it accumulated more than 55 billion euros of Greek government bonds which were excluded from the PSI and are still being serviced and repaid as normal. The outstanding amount at the moment must be just over 27 billion euros. 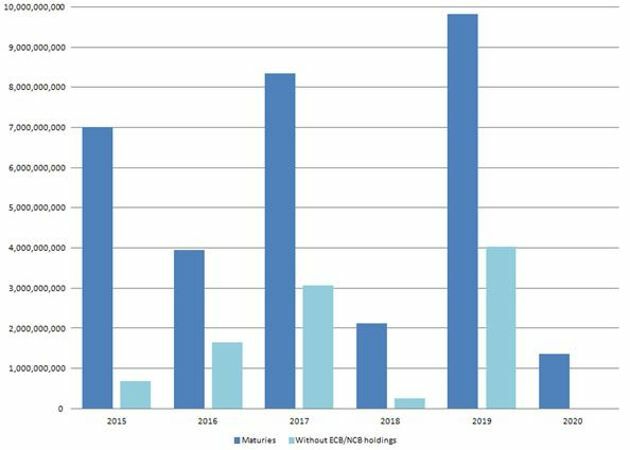 The holdings of the ECB and other eurozone national central banks (NCB) have a significant impact on Greece’s debt maturity profile until 2020. Excluding Eurosystem holdings, Greece would be looking at a very modest level of debt that it would have to roll over. 2017 and 2019 reflect the 3 and 5 year issues earlier in the year. These holdings in 2015 and 2016 require financing of 8.6 billion euros - 6.3 billion euros in 2015 alone. The servicing costs are an estimated 1.6 billion euros, by far the heaviest part of Greece’s debt to service since the new bonds that were exchanged to avoid the PSI had exactly the same principal, maturity and coupon payments. This has important implications for the primary surplus that Greece is expected to achieve so it can service its debt without accumulating new one. In November 2012 the Eurogroup agreed that the profits of those holdings would return to Greece, solely for the purpose of paying back debt. The decision is not endorsed by all central banks and does not change the financing requirement as Greece has to meet the maturity. The figure that is required to repay the ECB and other central banks over the next 5 years is just short of 23 billion euros. No other creditor has so many claims on Greece until the end of the decade. Not even the IMF. The IMF has disbursed to Greece 20.1 billion euros as part of the first program under a Stand-By Arrangement (SBA) and has additionally disbursed 12 billion during the second program in the form of an Extended Fund Facility (EFF). The last disbursement was 3.5 billion euros in the summer. The IMF started being repaid for the SBA last year and by year to date calculations it must have received just under 4 billion euros from the 7.4 billion that it is due to receive in 2014. Greece will have a long relationship with the IMF in the years to come. It is due to repay all funds of the first program by the end of 2016 and then start repaying the second program between 2016 and 2026, assuming Greece uses all the remaining funds available, a total of 16 billion euros. It is widely reported that Samaras’s intention is to use the 7 billion earmarked for 2014 and forego 2015 and 2016 disbursements. By the end of the year the debt to the IMF will represent 16.9 percent of Greek GDP. Irrespective of what happens with the IMF financing that remains, Greece needs 12.7 billion euros to continue the IMF repayments in 2015 and 2016. Servicing costs of the IMF loans come to just over 1 billion euros annually in 2015 and 2016, gradually reducing as the SBA gets fully repaid and the EFF gets amortised. With approximately 145 billion euros in loans, the ESM is by far the largest creditor of Greece, holding 43 percent of the country’s outstanding debt. The ESM is also the creditor that offers the most favourable terms since the November 2012 Eurogroup after the decision that interest payments to the ESM would be deferred for 10 years and loan maturities extended for 15 years. The average maturity of the ESM loans is now 32 years and the budget is only burdened by small fees on the disbursements, which are due to be completed by the end of the year. Once interest payments resume in 2023, they are expected to have a sizeable impact on the budget. The loans of the first program, aka Greek Loan Facility, amount to 52.9 billion euros. They were also extended in November 2012 by 15 years and had another 100 basis points shaved off the interest rate, which was reduced to 50 basis points above the 6-month Euribor rate. Current servicing cost stands at circa 0.7 percent annually and a budget burden of just under 400 million. Right after the PSI, 31.5 percent of the 197 billion euros of eligible bonds were exchanged for the equivalent of 62 billion euros in series maturing between 2022 and 2042. In December 2012, using approximately 11 billion of ESM funding, Greece bought back just under 32 billion euros of that PSI exchanged debt with a net debt reduction of 20 billion. The outstanding amount of circa 30 billion euros has the same repayment schedule between 2022 and 2042. Up to 2015 the servicing of that debt has a 2 percent interest, increasing to 3 percent up to 2020, reaching 4.3 percent from 2022 onwards. The immediate budget impact is 600 million for next year and 900 million from 2016. Greece had approximately 8.5 billion euros of holdouts on the PSI process. They are all foreign law bonds that escaped the retroactive application of Collective Agreement Clause (CAC) introduced to all the Greek law bonds. Holdout bonds are being serviced as normal and interest payments have an estimated budget impact of less than 500 million euros. 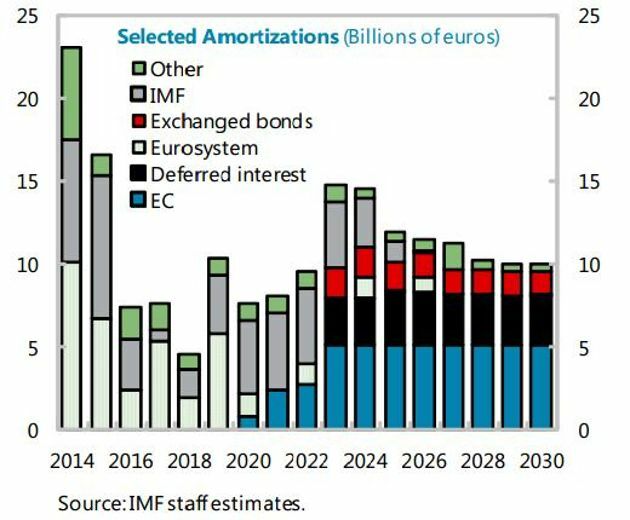 Selected maturities and financing needs over the next few years are captured in the chart below by the IMF. While there is an obvious political motivation in aiming for an exit from the bailout at the end of this year, the economic aspects of such a decision make it far from a cut and dried issue. The ECB/NCB holdings and the IMF repayments pose the most immediate challenges for Greece to have a clean troika break with the combined financing requirements over the next two years exceeding 20 billion euros, reaching 15 billion euros for 2015.